Question: With fishing season just around the corner and still snow on the ground, it looks like there will be high water for a while. Any tips on fishing when the rivers are raging? Answer: In the Northeast, spring fishing often involves very high water—our Western friends usually suffer this fate in May and June—caused by runoff or April showers. But after you’ve waited all winter for a chance to get on the water at all, there’s now way you’re going to let a little flooding keep you home. Here are 5 tips that will help you score, and stay safe, when you’re casting into a rushing river. Explore before you fish: Over the winter, there’s a good chance the character of your local river has changed somewhat. There may be new deadfalls, places where holes deepened or shallowed out, etc. Take the time—perhaps before the season starts—to look for new areas that might provide good trout habitat. 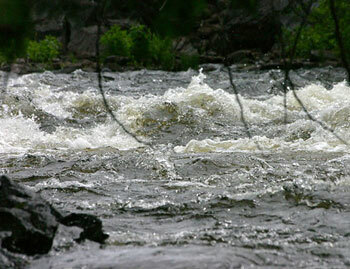 Especially keep your eyes out for places along the edges of the river where you’ll be able to fish in high water. Wade shallow, slowly, and carefully: Moving water is invariably more powerful than you think it is, so don’t wade out up to your chest to reach that spot on the opposite bank. No fish is worth getting washed downriver. When the water is high, it’s usually murky, as well, which means you often can’t see what you’re stepping on. There could be logs, big rocks, or a deep hole down there, so don’t make a step without feeling around with your foot first. Don’t walk in the fish: Before you charge into the water to cast behind a midstream boulder, look for good holding spots along the bank. Trout like to get out of the current as much as possible, and during high water, the migrate to the margins of the heaviest current. Focus your attention on trout lies along the bank—an indentation in the bank, a rock, some dead wood, etc.—where a fish could rest and still have food provided by the current. You might be amazed by the size of the trout you can catch within 2 feet of shore, or even under cutbanks. Use big flies: This is not a time for match-the-hatch tactics.Conehead streamers that move a lot of water, big stonefly nymphs, or flashy attractors—such as Copper Johns—in sizes larger than you’d normally use will get a trout’s attention in high water. Strangely enough, black is one of the best colors for dark-water fishing, although white and fluorescents often works well, too. Patterns that offer a lot of eye-catching motion are a plus. Use stout tackle: Because you’re fishing big flies in heavy water, go up a size in rod, line, and tippet. If you normally fish a 5-weight, break out the 6 or 7. Chances are, you’re going to be snagging junk on the bottom, or you may need to haul a big fish out of some bushes against the bank. Since visibility is low, you can get away with heavier tippet. Using a sinking tip or a longer leader than normal will help get your flies down in the current where the fish are.